Earlier this month, Governor JB Pritzker unveiled his plan for a graduated income tax in Illinois. Pritzker’s proposed rates would result in a $3.4 billion tax hike on Illinois families and businesses. The proposal is being pushed without any efforts to reform spending. The Governor’s proposal would move Illinois from a flat income tax rate of 4.95% to a graduated income tax with six tax brackets. Families and small businesses with income between $250,000-$500,000 would pay a state tax rate of 7.75%, while the highest rate of 7.95% would apply to all income over $1,000,000. As many small business owners file their tax returns as individuals, Pritzker’s tax hike would hit Illinois small businesses especially hard. In 2017, small businesses were responsible for 70% of Illinois’ jobs. Illinois’ corporate income tax rate would rise from 7% to 7.95%. Coupled with Illinois’ Personal Property Replacement Tax of 2.5% on corporations (1.5% on partnerships, trusts, and S-corps), corporate income taxes would rise from the current 9.5% to 10.45%, one of the highest tax rates in the nation. If approved by a three-fifths majority of the House and Senate, a question of whether the Illinois Constitution should be amended to allow for a graduated income tax would be placed before all Illinois voters. It is important to note that the Governor’s proposed rates would not be enshrined in the Constitutional Amendment. For taxpayers, this means that if and when the flat tax guarantee is removed from the Constitution, lawmakers will have a great deal more flexibility to raise tax rates to fund new spending. Last week in Springfield, Senator Mike Hastings (D-Tinley Park) and I sat down with Mark Maxwell of Capitol Connection to discuss Governor Pritzker’s proposal for a graduated income tax, and proposed legislation to improve compliance with existing Illinois FOID card laws. Senator Hastings and I have differing views on the graduated income tax issue and how Illinois should address the large budget deficit. Click here to watch that interview. On Tuesday, April 23, I will join State Representative Jeff Keicher (R-Sycamore) and State Senator Dave Syverson (R-Rockford) for a Town Hall Meeting that will focus on the Illinois budget. This public meeting will take place from 7:00-8:30 PM at the DeKalb County Community Outreach Building Blank Slate Room, located at 2500 North Annie Glidden Road in DeKalb. The event will be moderated by Eric Olson, General Manager of the Daily Chronicle. For additional information about this meeting, please contact my office at tom@tomdemmer.com. A report to the General Assembly, “Illinois Employment and Wage Update,” works with data on the Illinois economy to analyze where new jobs are being created, and describes the character and educational qualifications of these jobs. Data from the Illinois Department of Employment Security (IDES) and other sources shows an enduring trend within the Illinois job market towards labor-intensive services, particularly in the fields of education and health care. A look at total paycheck numbers in eleven defined employment sectors, ranging from mining to leisure and hospitality, shows a decade-long decline in the number of Illinois workers who make or build physical objects. For example, the number of Illinois paychecks paid out to manufacturing workers dropped from 657,400 in 2008 to 589,300 in 2018. While all of this decline was notched in only two years – the economic-downturn years of 2009 and 2010 – the pink slips handed out during the so-called “Great Recession” were not fully made up during the following eight years. As economic activity continued to move to other U.S. states and abroad, Illinois factories rehired less than one-third of the manufacturing jobs lost during the recession. There have been 28,300 new manufacturing jobs created in Illinois since the beginning of the post-recession upturn in 2010. Other Illinois economic sectors display much better numbers, but fields such as “professional and business services” (148,800 new jobs created in Illinois since 2010) tend to be areas of professional education where jobs are concentrated in the greater Chicago area. Furthermore, other areas of Illinois net job creation tend to be fields where employers demand specialized experience and educational training. This is particularly significant with respect to new jobs in “education and health services” (98,200 new jobs created in Illinois since 2010), as hospitals and health clinics want people with educational credentials. One major sector, “leisure and hospitality” (103,300 new jobs created in Illinois since 2010) is creating new non-credentialed jobs across Illinois. However, these are lower-paying jobs than the manufacturing jobs that have been lost. On Wednesday, March 6, it was my pleasure to host two 8th grade students from my alma matter, Sterling’s St. Mary’s School, at the Capitol. 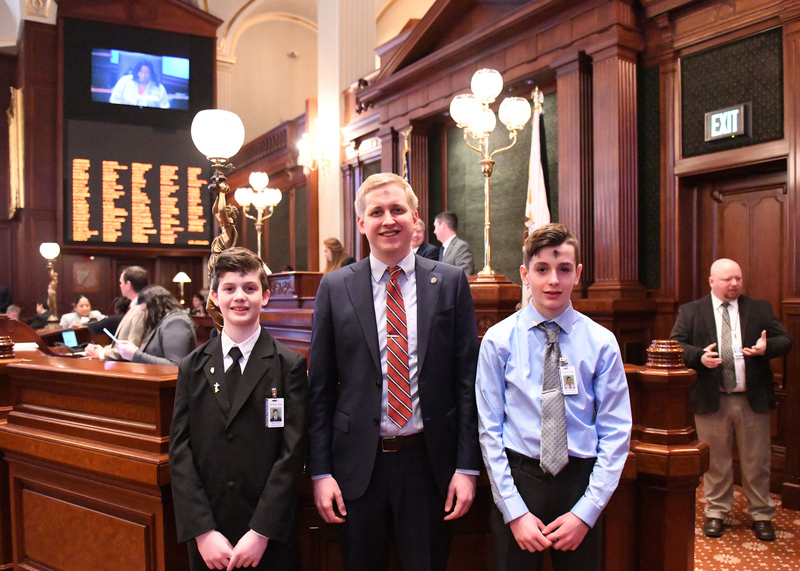 Tate Downs and Kenny Boesen are both from Rock Falls and I enjoyed showing them the floor of the House of Representatives. If you have a child who would be interested in participating in the House “Page for a Day” program, please contact my Springfield office at (217) 782-0535 to make arrangements. Figures gathered by the Illinois Board of Higher Education (IBHE) show a high percentage of Illinois public high school graduates are moving on to four-year institutions, but of the graduates who have progressed on to four-year colleges, 48.4% are studying at out-of-state institutions. This is a major increase from 29.3% in 2002, a figure posted prior to the major downturn of 2009-10 with its associated budget cuts and sharp increases in Illinois public-university tuition. Many Illinois families no longer find Illinois public universities to be an affordable option. Even those students who stay in Illinois often find themselves carrying significant student debts when they start their working lives. The IBHE is concerned that high-achieving students who leave Illinois will never return and will live productive professional lives in other states. Many state university systems try to lure highly qualified high school graduates out of Illinois by offering competitive scholarships and discounted tuition packages. Last week I had a great time at the Ogle County Farm Bureau’s Legislative Luncheon. This organization was created in 1917 when a group of 30 Ogle County farmers decided to collaborate and promote agriculture in the region, state and nation. Today there are more than 1,200 family farms operating in Ogle County, and about 75% of the county’s land is dedicated to farming. According to the Farm Bureau, Ogle County farmers annually generate more than $300 million in sales of commodities, including grain and livestock. Each year, the Ogle County Farm Bureau offers several scholarships to college students. This year’s application deadline is Monday, April 1. Click here to access the application and instructions. To learn more about scholarship eligibility and the judging criteria, please contact the Bureau by phone at (815) 732-2231, or via email at rek@ogle.comcastbiz.net. You can also access the scholarship information on the Ogle County Farm Bureau website at www.oglefb.org. The year-over-year trends were negative in thirteen separate Illinois metropolitan areas. While some of these areas were successful in creating new jobs, local increases in the numbers of people looking for jobs outweighed the number of jobs created. Metro areas with higher unemployment rates in January 2019 than had been posted in January 2018 included Bloomington-Normal, Carbondale, Champaign-Urbana, Lake County, Peoria, Springfield, and the Metro-East region of greater St. Louis. In four metro areas – Decatur, Elgin, Kankakee, and Rockford – Illinois unemployment rates were more than one full percentage point higher in January 2019 than they had been in January 2018. Unemployment decreased in the Chicago metropolitan area during the same twelve-month period, falling from 4.9% to 4.4%. This marked a continued widening of the “jobs gap” between Chicago and the rest of Illinois, in which jobless figures higher than Chicago were posted not only Downstate but also in outer suburban areas such as Elgin and Lake County. The January 2019 unemployment rate in Kankakee, only 60 miles south of Chicago, was 3.1% higher than the jobless rate in greater Chicago. McHenry County Sheriff’s Deputy Jacob Keltner, who was serving as an assistant U.S. Marshal, was killed in the line of duty on March 7 in Rockford. The tragic incident happened when a team of federal marshals was initiating the serving of an arrest warrant upon a suspect in multiple cases of armed robbery. Following the fatal shooting, suspect Floyd Brown fled the scene. A lengthy car chase shifted the scene to a Central Illinois police standoff on Interstate 55 near Lincoln, and I-55 was closed off to traffic for several hours before the suspect was finally taken into custody. Brown is charged with first degree murder of an officer and is also facing federal charges because Keltner was assisting U.S. Marshals. On March 13, as family, friends and law enforcement attended the funeral for the fallen deputy, members of the Illinois House approved an honorary resolution, recognizing the life, service and sacrifice of this hero. A post-funeral procession for Deputy Keltner included close to 800 police vehicles from across Illinois, and from departments in Iowa, Wisconsin and Indiana. A 2019 Legislative Survey was recently mailed to households in the 90th District. Important votes are coming, and I want to offer constituents the opportunity to share their views on several key questions. The survey includes six multiple choice questions, and participants will also be offered an opportunity to subscribe to an E-newsletter that will include updates on legislation and other issues affecting Ogle, Lee, DeKalb and LaSalle Counties and the State of Illinois. The survey can also be accessed through the “Constituent Survey” link on my web site at tomdemmer.com. Survey responses will be accepted through April 15.